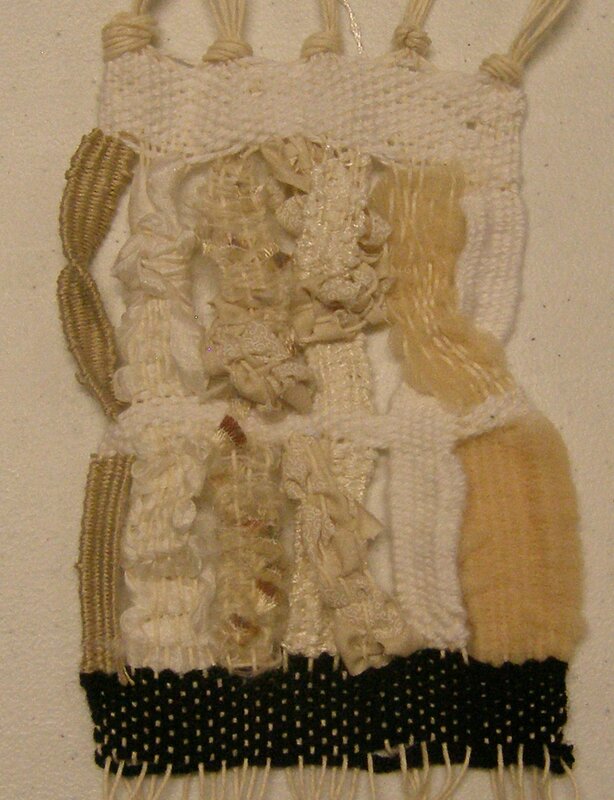 This Project is all about tapestry weaving using a very basic weaving frame. 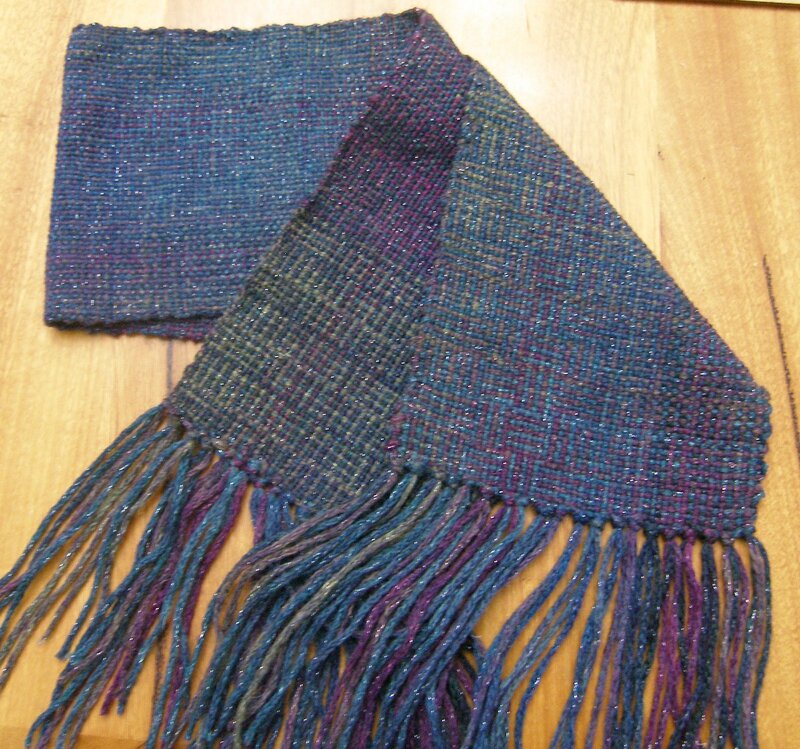 I used it as a great excuse to ask for a Rigid Heddle Loom for my birthday as, depending on the positioning of the heddle, this can act as a weaving loom or a tapestry frame. Stage 1 is to warp up the frame which I did by following an online video from Ashford Weaving. 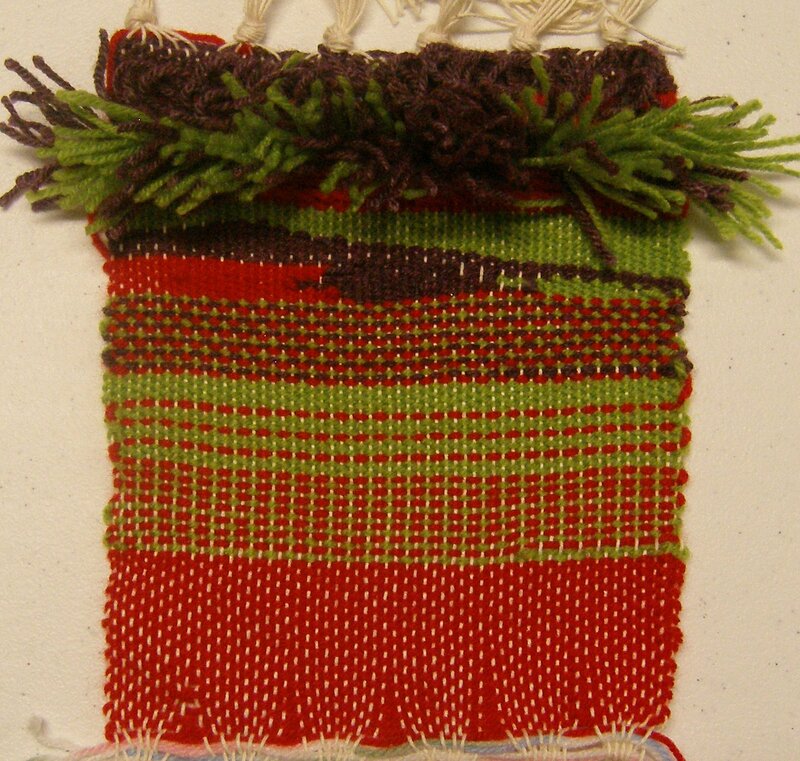 Stage 2 is to do some basic weaving simply to get a feel for the process, and then to start introducing other colour and techniques such as Soumak and Ghiordes knots. This is my first sample, trying the different techniques. Some of the techniques are lost under the rug-like effect of the Ghiordes knots near the top. Stage 3 is to do a further sample introducing different materials and experimenting freely to produce different effects. 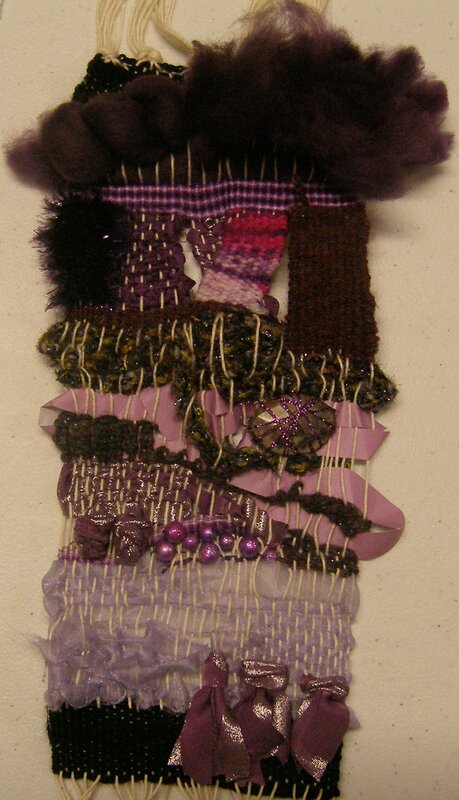 I worked my sample below in a purple colour scheme to provide a commonality to the different materials and techniques. – more glitzy fabric in Ghiordes knots. I particularly like the effect of adding the flat stone as this provides such a contrast in surface texture. The final part of Stage 3 was to select one area from the above sample and extend this further. I chose the section worked in slit weaving where I had twisted one section over another. This was not a technique I had picked up from anywhere but created myself (although I am sure lots of other people have had the same idea and done similar work!) and I wanted to explore it further. I secured the base of the weaving with a strip of black just to form a firm base. Then I worked different widths in different yarns and materials. To get the twist effect I cut the warp threads of the sections involved, swapped them over and re-warped them. A woven strip secured the strips in the new position. In the second section I twisted the right hand strips, twisted the central strip across to the left, over to the right and then back to the middle, knotted the second from left strip and just twisted the left end strip around itself. This was a very time consuming sample to make and fiddly getting the tension right after cutting and repositioning the warp threads as they were different lengths depending on the treatment of the strips. it does produce a lot of variation in textures aside from that given by the materials themselves which included embroidery thread, strips of silk fabric, strips of cotton fabric, knitting wool, mesh strips and fancy yarns. As well as doing the tapestry weaving samples for the course I couldn’t resist using the loom to make some “normal” scarves. This first one uses 2 yarns from the same family, one a plain blue and one variegated blue/green/purple. 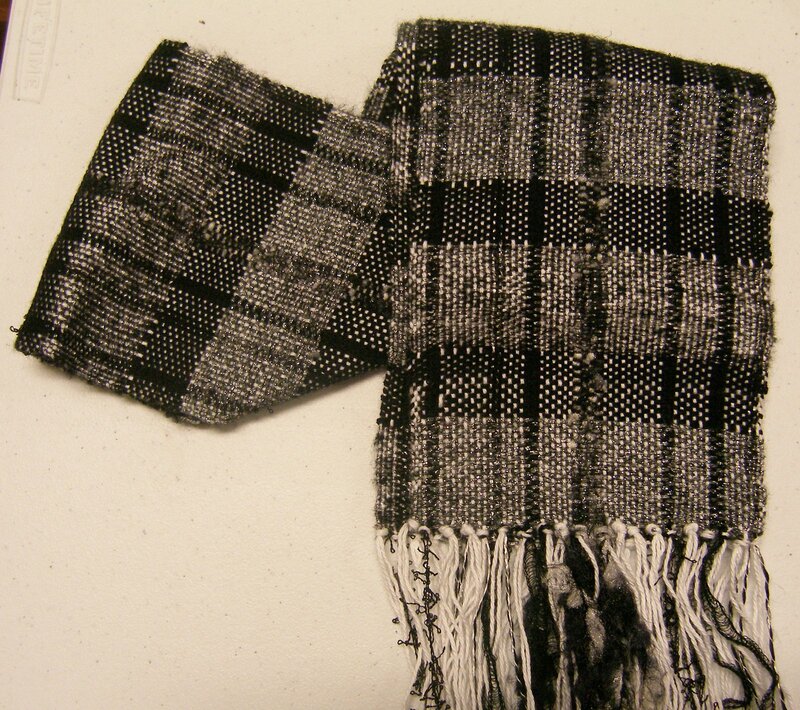 For my second scarf I varied the warp by using a mixture of white wool with random black warps and a heavier fancy yarn. I used two different greys for the weft and worked these in alternate blocks, separating them with narrower bands of black. It was great fun playing with my new loom, I enjoyed all the experimental samples and was surprised at how quickly the scarves worked up.